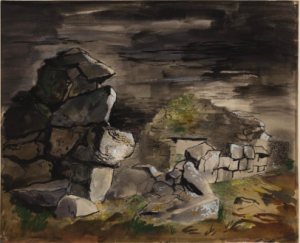 During the Second World War, John Piper was commissioned by the war artists to capture the affects of the war on the landscapes. Tasked with collecting the architectural drama created by the Blitz, Piper set out to portray how the cathedral [and other buildings], overnight, had been turned into blackened ruins. Piper’s personal interests towards ruined buildings, as well as the lost of his eldest brother in the First World War likely enabled him to respond, through art, with the deepest emotion. His paintings do not always reflect the physicality of the bomb damage; instead, a sense of nostalgia and loss was emphasized. The poem, “Ode to the Full Moon During an Alert” is Namur King’s attempt to capture the war-stricken world underneath the moonlight. Similar to Piper’s paintings, King focuses on the sense of loss through the usage of the moon as a symbol of “the shame of nations.” However, these particular lines (4-11) highlight a contrasting sentiment in that despite the destruction and loss, there is “tranquility” and eloquence. Fading beyond your fair translucency. Transcended by a deep tranquility. The Blitz (London Blitz) refers to the strategic bombing of London and other cities in England by the Germans. Targeting highly populated areas, factories and dock yards, the Blitz of WWII represented a new kind of war: the massed aerial bombing of a modern urban population. It is often considered the most determined effort up until then to win a war by bombing from the air.